You do not have to tolerate caricature, criticism, critique, irony, parody. When you make $230k+ as a University President, when you have the power to run an academic institution, when you have a Respectful Learning and Working Environment Statement and critiquette shoring up this power, there are many things you do not have to tolerate. You do not have to tolerate criticism or critique. You don’t have to tolerate parody narrative or music. No edgy ironic video. No mockumentaries. No way do you have to tolerate political puppetry or theatre, especially in a tradition of Bread and Puppet Theater. And you surely do not have to tolerate critical sculpture. If in your interest and honour, then yes by all means let them sculpt, chisel mountains. Let them name suspension bridges and valleys after you. Anything less than honorific, you do not have to tolerate. Just say no Capilano, No. Faculty and students you cannot write, perform, think or say this. When you are a University President you do not have to tolerate this. When you are the head chef in the big kitchen you do not have to take the heat. 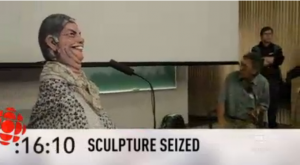 Read More: Capilano University censors sculpture of president with poodle and view the puppet performance. I’m indebted to you for this uncanny and powerful endoresment. When under attack by admibnistrators it’s reassuring and inspiring to have such strong support, and excellent poetry too. Thank you George, for your immensely creative, insightful artwork and leadership across higher education! Thank you for backing up one of the most precious educators and sage artists I had the serendipitous fortune to be taught by. The entire situation is a complete outrage. We have lost a crucial and uniquely enriching (both to those who attended and our society as a whole) educational programs and, now, the responsible folks with power are silencing artistic expressions of dissent. Unbelievable. Untenable. Horrific. Deeply disturbing. RETURN THE ART.